AddPDF is an app for joining several PDF files into one single multipage PDF file, or splitting multipage PDF files into multiple single page PDFs, one per page. AddPDF is easy to use. Simply drag PDF files, or other file types which can be automatically converted, into the file list, re-arrange them using drag and drop. Then click the "Add" or "Split" button to combine or split them. • Automatic file conversion from images, RTFD, RTF, plain text, web archives, and mail messages (eml) to PDF when added to the file list. QuickLook previews of files are created when other conversions are not possible. • Support for "watermarks" with transparency. 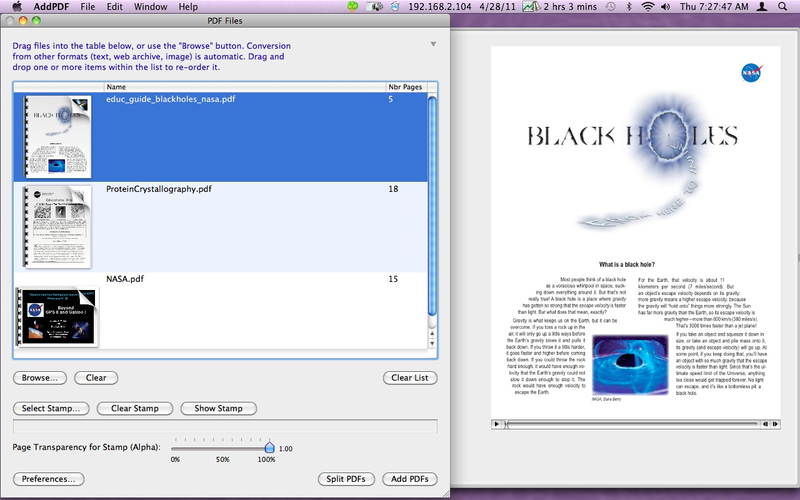 Use the "Stamp" button to select a PDF or any other convertable file (see above) to use as the watermark, and choose the transparency using the "Alpha" slider. Only the first page is used as the watermark. • The file list contains a column that displays a QuickLook thumbnail of the file to help you organize the files placed into the list. • PDF "Splitting": A button named "Split PDFs" invokes a procedure which creates multiple single page PDF files for each page of every PDF file in the file list. You will be prompted for a name "prefix" for the generated files which will be appended by bracketed by suffixes of the form "[m, n]" where "m" is the PDF index, and "n" is the page index. Splitting supports stamps so that each single page PDf is stamped by the stamp file. • When "stamping" pages by another PDF (which may be a PDF generated from an image automatically by the program) you have the option to scale the PDF so that it fits completely inside each page. Otherwise the stamp is merely centered over the page, which may result in cropping by the page bounds. This option is selected in Preferences and is named "Center Stamp Inside Page Bounds." This option is on by default. • When adding or splitting PDFs you have the option of only using the first page of every PDF file in the file list. This option is selected in Preferences and is named "First Page Only." This option is off by default.